KEAM 2019: Kerala Engineering Architecture Medical Exam is also known by short name KEAM. KEAM 2019 will be conducted by Commissioner for Entrance Examinations (CEE) to give the opportunity to all the eligible candidates to get admission into UG Engineering & Pharmacy courses in Kerala state. Latest Update: Engg./Pharm. Entrance Examination Rescheduled to 2nd & 3rd of May!! Latest Update: KEAM 2019 Syllabus Released!! Check the link Below. 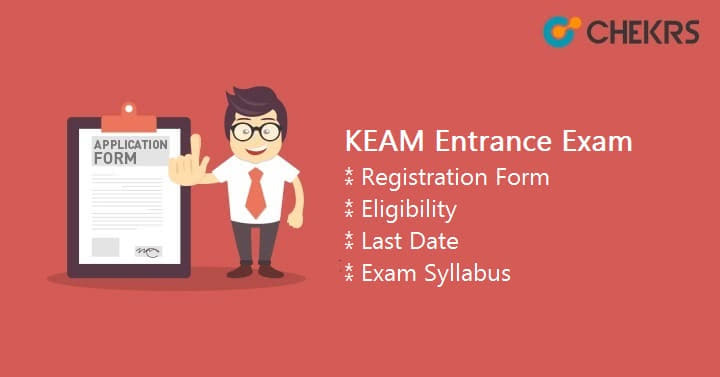 Latest Update: KEAM 2019 Registration Started Form Today. Check the Procedure and Last date below. Latest Update: KEAM 2019 Exam Date Announced!! Check the Notification and Date below. Latest Update: Admissions in Medical & Allied courses like MBBS, BDS, Ayurveda, Homoeo, Siddha, Unani, Agriculture, Veterinary, Forestry, Fisheries will be done through NEET scores from KEAM 2019 . KEAM Exam is a state level entrance exam, conducted every year to fill seats in various colleges of Kerala. We are trying to mention all the tentative details of KEAM Application Form this upcoming exam. We are also providing some tentative dates of KEAM 2019 examination. These are expected dates and we have to wait for any official notifications and news to confirm the dates. Interested candidates are advised to check all the Kerala KEAM Eligibility Criteria before directly going to the Application filling procedure. Candidates must be Indian Nationals/PIO/OCI. All the candidates will be categorized as Keralite, Non-Keralite Category 1 and Non-Keralite Category 2. Passed Higher Secondary examination or its equivalent examination, with 50% marks in mathematics separately & in PCM subject together. Medical & Allied Qualify NEET exam. And Also satisfy the nativity conditions stipulated in KEAM 2019. *Allied Courses: MBBS, BDS, Siddha, Unani, Agriculture, Ayurveda, Homoeopathy, Veterinary, Forestry, and Fisheries. KEAM Last date for submission of KEAM 2019 Registration Form/ application, and Fee payment will be in February 2019, Last week. Candidates except for ST category, have to pay the application fee after filling the application form. Candidates can make payment by credit card, debit card, internet banking or DD (Demand Draft). The KEAM Application Fee will be Rs. 700/- for Engineering only/ B.Pharm only/both. The application fee will be Rs. 300 for SC candidates for Engineering only/ B.Pharm only/both. First of all, candidates have to register them self to the official website. After it, they will receive the confirmation Mail and SMS. Now they have to log in to the page and fill up the application form by providing correct details. Now they will need to upload photograph, signature & left-hand thumb impression. After filling these details and submitting the form they will be redirected to the Payment page where they have to pay the fees. After it, they will be asked to print-out the KEAM Application Form 2019 along with the payment details/Receipt. The exam pattern will help you to prepare better for the exam and in this exam, there will be 2 offline papers with a total of 240 questions. The KEAM Exam Pattern 2019 is given below. The KEAM 2019 Syllabus will be from the Higher Secondary (12th) or equivalent examination subjects. It contains topics & chapters from 12th Physics, Chemistry & Mathematics subjects. The question papers will not be based on NCERT textbook and any other textbook. The KEAM syllabus 2019 will be prescribed online on the official website by the CEE, Kerala. The KEAM 2019 admit cards will be probably released online on the Official website. Candidates have to download their KEAM Admit Card 2019 through from the official website. Candidates just need to enter the application number and date of birth to download the KEAM Hall Ticket. After downloading the admit card make sure to take a print out of it because you will need it in examination Centre. The KEAM Result will be declared by the authority after a few days of the engineering examination. It is expected to be declared in the 3rd week of May 2019. It will be declared through the online mode. After the exam answer key will also be released by the exam authority. The Exam authority will also release separate KEAM 2019 rank lists for engineering courses. The KEAM 2019 Rank List (separately for paper/courses) is expected to be announced in the 3rd week of June 2019. The KEAM 2019 Counseling is expected to be started from the 4th week of June 2019 through online mode. After log in to the website, qualified candidates need to fill choices of courses and institute as per their preferences. In the KEAM Counselling 2019 Process, centralized allotment process will be done through the SWS (Single Window System) to offer Seat allotments to various courses & colleges in state Kerala. The seat will be allotted to the qualified candidates on the basis of their filled choice, category, rank, and availability of seats. After the Kerala KEAM Seat Allotment, admission to the engineering courses will be done on the basis of merit list which will be prepared by taking the ratio of 50:50 of the marks secured in exam & the marks secured in 12th PCM subject together. After qualifying in the Exam and Counselling candidate will get their seat in the institute in state Kerala. Candidates have to report to the allotted institute in the given time period. KEAM 2019 exam is a great opportunity for candidates who are appearing in Higher secondary examination now. It will open the doors for you to get admission in various UG Engineering & pharmacy courses in Kerala state. So if you are interested in KEAM 2019 Examination, check the Official website regularly.